Gout is a type of arthritis in which the high uric acid levels in the body deposits in the joints mainly toes, ankles, hands and wrists. Purine compounds, whether produced in the body or from dietary sources can cause high uric acid levels. Other major causes of high uric acid levels include obesity, heavy alcohol intake and kidney disorders. Major symptoms of gout include.. The dietary intervention program focuses on reducing the amount of uric acid levels in the body and focusing on a low purine diet along with low calorie diet if weight loss is desired. Dietary focus to treat gout also revolves around low fat consumption, whole grain diet and inclusion of antioxidant rich fruits and vegetables. It is best to focus on low fat dairy products as a source of protein. Keeping this in mind, foods that should be included are…. • Low fat dairy products like milk, curds, buttermilk etc. • Fiber rich fruits and veggies. However spinach, asparagus and mushrooms should be consumed in moderation due to their purine content. • Beans and legumes in moderate amounts. • Include healthy fats like avocado, walnuts etc. which help control inflammation due to high moega-3 fatty acid content. Try Avocado Dip as a variation. • Focus on water consumption. Have at least 8 glasses of water per day. It helps avoid dehydration and flush out excess uric acid. 1. Non vegetarian foods such as meat, bacon, turkey and some types of fish. 5. Sugary beverages and desserts like cake, candies, doughnuts etc. While this diet is not a cure, but it definitely will help to reduce the joint pain and progressive damage to joints. 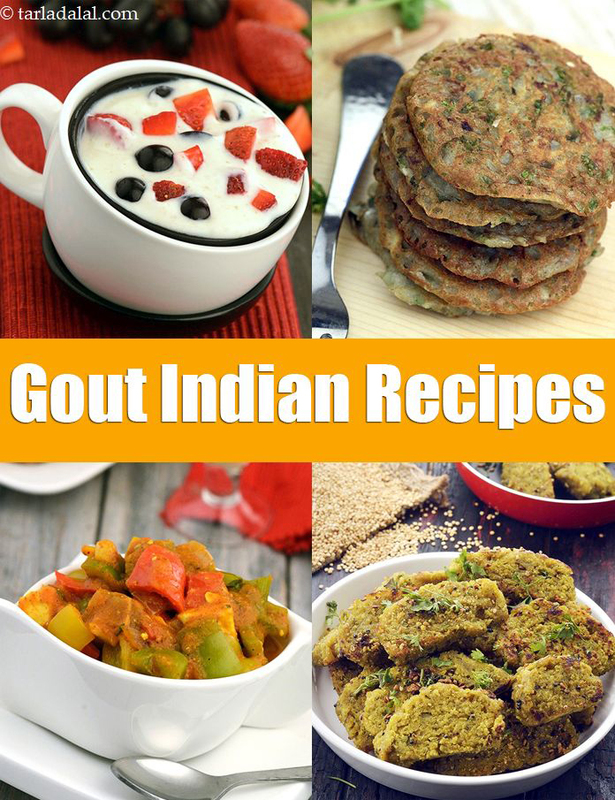 Thank you for these gout recipes! Healthy fats are must for gout sufferers! Tarla Dalal Hi Richard, Happy to know you liked our recipe collection.